Typewriters had the QWERTY keys from which the present day keyboard gets their layout.The faster one types the faster one can finish work, but most beginners find it hard to type faster, if you observed seasoned users they tend to touch type ie., typing without looking at the keyboard with fingers reaching out to keys as they type.This kind of typing skills come out of practice.If you are having the need to look at the keyboard for key as you type then you can improve your typing speed by learning the tricks of typing faster and practicing typing using Tipp10, which is a typing tutor application which has a lessons to practice keystrokes and with performance tracking to measure the improvements at the lessons proceed. The program come with 20 lessons, starting from the basics of asdfjkl; for the beginners, The duration for each lesson can be time-based or character based. or The program tracks the users performance and characters that are mistyped are repeated more frequently, for improvements.On-Screen assistance during lessons can be set before starting the lesson. The progress or improvements in ones typing skills, can be reviewed under Results in the Go Menu.This results window shows the lessons taken, duration of each lesson, error rate, Cpm (Characters Per Minute) and the overall score.The most interesting information is under the Fingers Tab, which shows the fingers which are causing the maximum errors which helps understand the scope of improvement. If you are bored typing the same the over and again, new lessons can also be created with a text of your choice.To do this In the main window, the 3rd tab ( the pencil icon ) under which users can create their own lessons.The new lesson can be copy-pasted if you choose to create a new lesson or if you choose to import a lesson which can be a text file (.txt) using the import function.Each of these lessons can be practiced dictated as “Sentences” or “Word” Lessons. 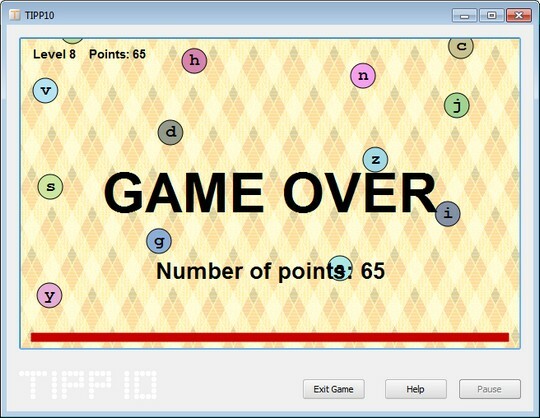 Once you have practiced and gained proficiency you can test your skill on the next level playing the ABC-Game which is similar to Tetris but here its alphabets instead of bricks, which you should keep typing before the first letter touch to the bottom, with each level the speed of the dropping letters increases making the game even tougher. 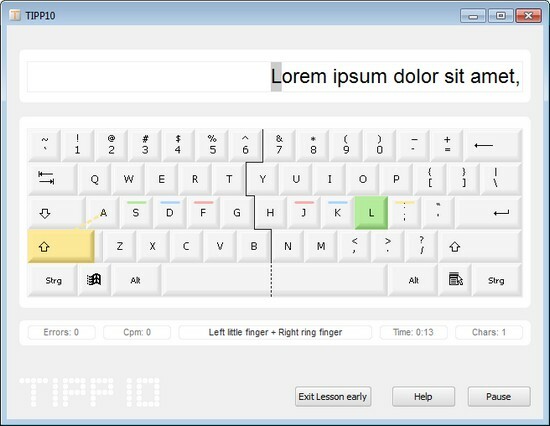 Tipp10 – Typing Tutor program is available for Windows, Linux and Mac OS.A Portable version is also available for Windows Platform, making it easier to practice on any system with saved lessons.